AKC judge shares sanity and life-saving tips for taking your dog in the car, moving stress, safety with children and visitors, winter care, overweight dogs, and more! First, a word about winter. 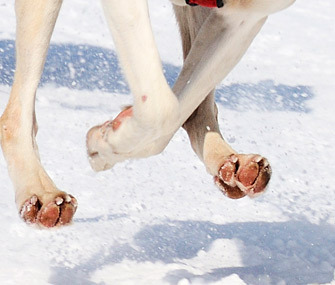 A dog’s pads can freeze to anything metal and the pads are difficult to treat. Owners of profusely coated dogs like to trim the feet to reduce tracking but be sure to leave hair level with the bottom of the pad and do not trim between the toes. The hair between your dog’s foot pads protects it much like boots protect you. Snow and ice irritation may cause excessive licking in winter and so can the brine, beet juice and other stuff they use to treat icy roads nowadays. Unsafe chemicals can cause kidney failure in dogs, so make sure you buy “pet safe” anti-freeze and sidewalk salt. By the same token, summer heat and metal truck beds often result in serious burns. 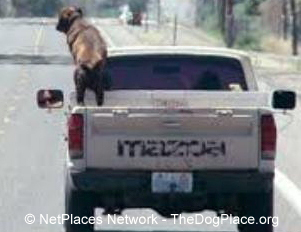 How many times have you seen a dog in the back of a pick up truck? Besides flying out of the truck bed on a turn or stop, there are other safety issues. Riding in the front seat doesn’t offend your dog. Most want to drive. Others stick their head out the window and their ears fly. What puzzles me is why, when I blow in my dog’s face, does it act offended? When traveling, your dog is safer in a crate, especially in case of an accident, and cats should always be crated. A gas stop is a window of opportunity for a cat but if your pet wears a harness and light lead, it is easier to catch. If a cat gets excited and throws a car fit, you could lose control of the car! It’s hard enough to explain an accident but try explaining a “spooky cat fit”. 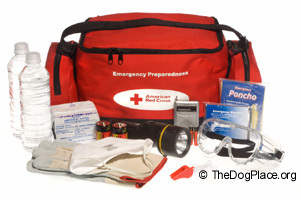 Small carriers are available for your pet's safety. 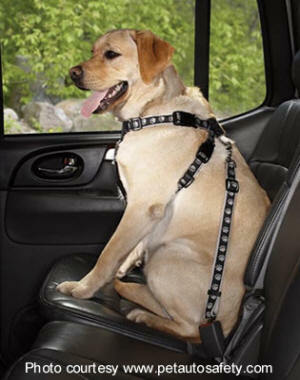 Pet shops offer seat belts for dogs. These belts strap into your car’s safety harness. If a door pops open in a fender bender, your pet doesn’t escape. Does your dog get car sick? First, leave an open crate at home for the dog to enter at will. Advance to the car. Hold the dog on your lap in the front seat (on a towel). Make the first trip short, allowing someone else to drive. Second time, feed the dog a little honey to settle its stomach and take another short “lap” trip. Third attempt, (you can drive) place the open crate in the front seat and put your hand inside for security. Eventually, close the crate, keeping it next to you. Given time, the squeamish canine should ride in back. It’s important your crate have solid footing. Take a roll of paper towels along in case of unexpected stops. Pick up and dispose of waste. If all else fails, your vet can prescribe sedation. Relocation confuses pets. Some dogs will walk miles back to their original home. Other pets dash through an open door and are never seen again. One cat, lost 100 miles away in the spring appeared on the owner’s porch during Thanksgiving dinner the following fall. Identified by “tricks” the owner taught him, without a doubt, it was “Chuck”. Dogs, and especially cats, abhor moving. One person sold their house, cat included, with the agreement the sixteen year old cat would live out its life there. Relocation was NOT on that cat’s agenda. Dogs, on the other hand, are more adaptable as long as they are with a pack member (you) they love. Even older shelter dogs adjust to new homes and those with prior training seem to desire human contact and appreciate it more. Small dogs fit most seniors and they love laps. Toy dogs must have a protected environment. When visitors arrive, advise them to ignore your pet. It will approach them if it wants; if not, make a safe place available. Never allow small children to hug your dog’s neck. They should NOT carry your cat. An unexpected sneeze while holding a cat can be disastrous. Bites or scratches cause “cat fever” and require medical assistance. Some dogs are voracious when it comes to food. Pick up that food bowl. My friend's dog tore into a sack of dog food and died of overeating, head in sack. Small dogs “balloon” with weight. Overeating causes dogs to drink excessive water. This causes bloat and can result in death. Overweight dogs cannot clean themselves properly. Cut the hair around the tail and privates, especially if the animal has a long coat. Encourage exercise and activities that prevent weight gain. Some pets intuitively know when a trip to the Vet is imminent. Some owners spell words, but never underestimate your dog’s ability to read your mind. It quickly puts letters with your actions and won’t be fooled. You dog loves to go but if you must leave him in the car in winter, LOCK THE CAR DOOR, leaving a window cracked for ventilation. Be vigilant in warm weather. Shade can quickly move to become blazing sun and your car can become a deadly oven within 20 minutes. Professional groomer on itchy dry-heat skin, coat and foot care.